The CeMM Library of Unique Drugs (CLOUD) is the first condensed set of FDA-approved drugs representing all clinical compounds. Its potential was shown in a combinatorial high throughput screen at the CeMM chemical screening platform, published in Nature Chemical Biology: by testing all CLOUD compounds in combination with each other, a pair of hitherto unrelated drugs proved to be highly effective against multiple prostate cancer cell lines known for their resistance to therapy. Two drugs taken together can sometimes lead to outcomes that largely deviate from the effect of the separated compounds - a fact well known from warnings on patient information leaflets. However, while doctors strongly advice against unsupervised mixing of drugs, the synergy of two combined pharmaceuticals assessed in an experimental setting can reveal completely new therapeutic options. Nevertheless, finding a novel combination of drugs for a given disease within the more than 30,000 drug products approved by the regulatory agencies was hitherto a big challenge for scientists. 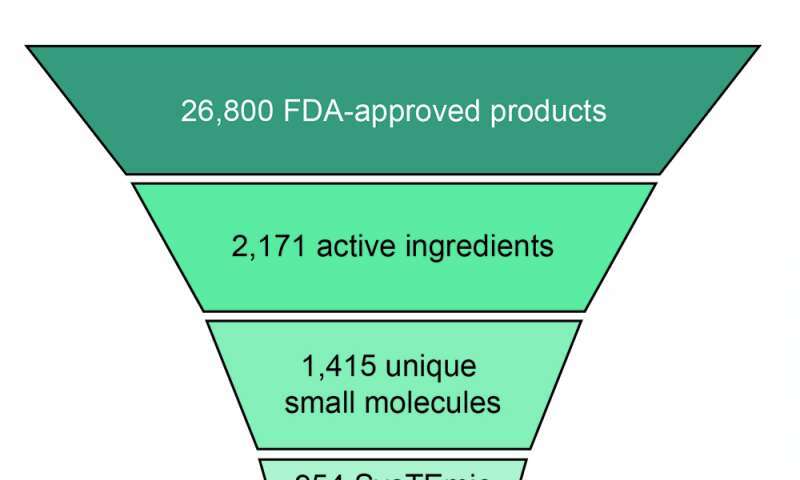 With the remaining 954 systemically active small molecules (STEAM collection), the work had just begun: in order to create a comprehensive collection of compounds that fits on a standard 384-well screening plate, the researchers appended biological activities to all drugs with known molecular targets and grouped them into 176 classes of similar structure and activity. With a sophisticated clustering algorithm, 239 representative drugs were selected from those classes. Combined with 34 drugs with unknown target and 35 active forms of prodrugs (that otherwise need to be metabolized to become active), 308 compounds were selected in total for the CLOUD - the world´s first library representing all FDA-approved chemical entities including the active form of prodrugs. To put the combinatorial screen with the CLOUD to the test, Kubicek's group investigated the effect of pairwise combinations of CLOUD compounds on the viability on KBM7 leukemia cells, a cell line well suited for drug experiments. Using a dose chosen for each compound individually based on the clinically relevant maximum plasma concentration, the scientists found a strong synergistic interaction between flutamide, a drug approved for the treatment of prostate cancer, and phenprocoumon (PPC), an anti-thrombosis compound. 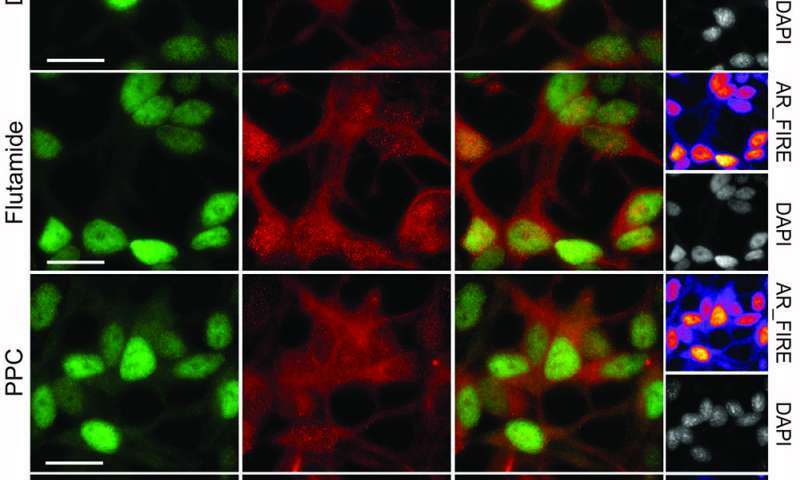 In combination, flutamide and PPC efficiently killed the cancer cells. After identifying the androgen receptor (AR) as molecular target of the synergistic interaction, the scientists tried the drug combination on prostate cancer cells known to be hard to treat - and hit the bulls eye. "The combination induced massive cell death in prostate cancer cells. We then went back to the entire approved drug list, and indeed, we could show that all drugs from the clusters that flutamide and phenprocoumon represent synergize. Thereby we validated the reductionist concept underlying the CLOUD library," Stefan Kubicek explains. With their experiments, Kubicek´s team in collaboration with scientists from the Medical University of Vienna, the Uppsala University, Enamine Kiev and the Max Planck Institute for Informatics in Saarbrücken proved that the CLOUD is the ideal set of compounds to develop screening assays and discover new applications for approved active ingredients. At CeMM, a number of key discoveries on new applications for approved drugs have already been made with the CLOUD. Furthermore, as shown in the current issue of Nature Chemical Biology, the CLOUD is ideal for finding new drug combinations. "In view of these successes, I would predict that this set of compounds will become world standard for all screening campaigns", Stefan Kubicek emphasizes.